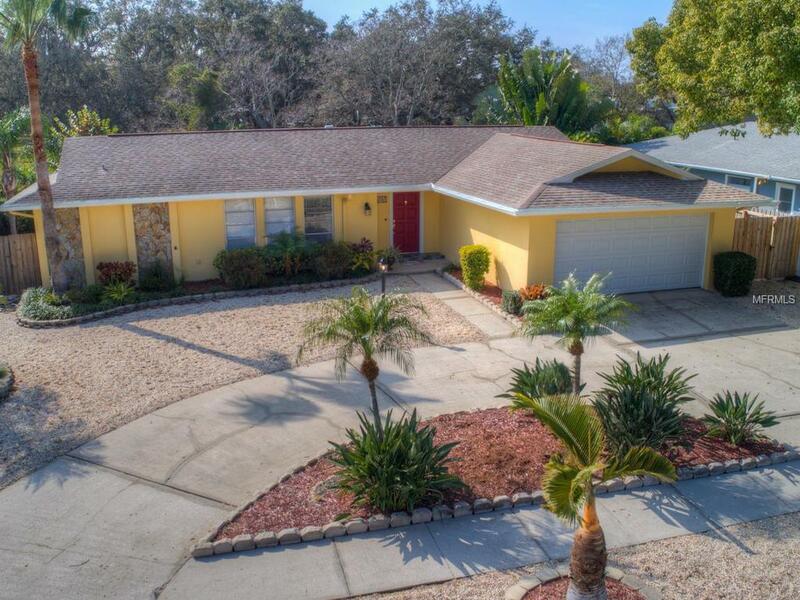 Youll love this charming, ranch style home with a Key West Style curb appeal. This spacious 2-bedroom, 2-bathroom home with a 2-car garage will give you plenty of space to move about without losing that quaint, cozy atmosphere. Spacious bedrooms provide plenty of storage with master bedroom having a large walk-in closet. Wood shutters accent the family and guest bed room. Backyard paradise with mature landscaping comes with a sparkling salt water pool with "pebble sheen tech finish", caged pool enclosure and a private spa is an entertainers delight and perfect for play, or just relaxing on a weekend. Situated in a friendly community with an award-winning school system, quick and easy access to the Gulf Beaches, shopping and restaurants. Make this one of your Must See properties today! No Flood Insurance needed. Buyer agents to verify room dimensions. Sold As Is.